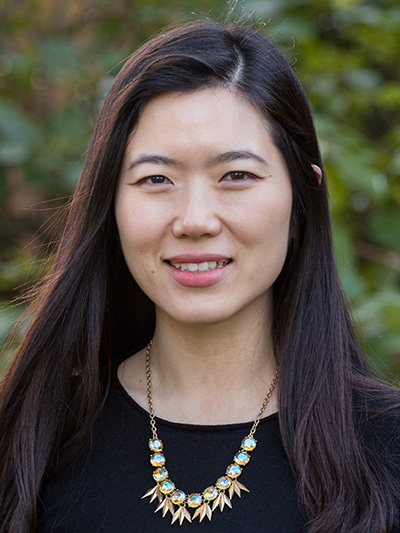 Sarah Song Southworth joined George Fox as an assistant professor of marketing in 2016. Previously, she worked for three years as an assistant professor specializing in fashion marketing in the department of Textile and Apparel Management at the University of Missouri. Prior to that, she was a graduate instructor and researcher in Design and Human Environment at Oregon State University (2007-13). Sarah earned a PhD focusing on visual and cross-cultural marketing from Oregon State University (2013), a MA focusing on consumer-centric apparel design from Oregon State (2009) and a BS degree focusing in merchandising and product development from Cornell University (2005). Her interdisciplinary background using both qualitative and quantitative methods allows her to contribute to a diverse body of research knowledge on visual and cross-cultural marketing, and more recently on service marketing. As a researcher, she loves to examine how consumers journey through their experiences with different brands. Her faith shapes the way in which she conducts her marketing research over the years. She believes that empathy towards the consumers’ well-being and needs, insightful thinking, and data-driven research can provide companies with effective and sustainable marketing strategies. She is also an advocate of complementing theory (understanding the why in the doing) with practice (the doing) because practice alone can lend itself to aimless execution, while frameworks alone are too general to understand the variation in different applications. Consequently, she is continually open to engaging her community to partner with her in research and teaching. As an educator, she wants her students to learn how marketing is used to improve, not harm, the quality of human lives. She wants them to treat their future clients and consumers with love and dignity. In this way, she strives to counter the popular anti-marketing sentiments towards tainted marketing practices. She is also dedicated to empowering her students to practice their faith to “light” in the industries they enter. Her hope is that the companies can see an intangible attractiveness which comes from the students’ love for people and community. Jai, T. M. & Southworth, S. (2017). Communicating love in the restaurant service environment using the five love languages. Christian Business Faculty Association, San Diego, CA, USA. Southworth, S.S. & Ha-Brookshire, J. (2016). The impact of cultural authenticity on brand uniqueness and willingness to try: The case of Chinese brands and U.S. consumers. Asia Pacific Journal of Marketing and Logistics, 28(4), 724 – 742. Southworth, S. & Ha-Brookshire, J. (2016). Role of Asian cultural authenticity on U.S. Consumers' Perceived Quality, Trust, and Patronage Intention. Proceedings of International Textiles and Apparel Association, Vancouver, British Columbia, Canada. Southworth, S. (2016). U.S. Consumers' Patronage Intentions towards Asian Brands' Uniqueness: Moderating Role of Consumer’s Lifestyle. Proceedings of International Textiles and Apparel Association, Vancouver, British Columbia, Canada. Southworth, S. & Jai, T. M. (2016). Love language scale in retail service environment: An exploratory study. Proceedings of International Textiles and Apparel Association, Vancouver, British Columbia, Canada. Duttagupta, A. & Southworth, S. (2016). Strengths and weaknesses of the luxury flash sale websites' customer service. Proceedings of International Textiles and Apparel Association, Vancouver, British Columbia, Canada. Thompson, S. & Southworth, S. (2016). Recipe for success for fashion small businesses in college town: Fresh urbanism with a heaping side of country hospitality. Proceedings of International Textiles and Apparel Association, Vancouver, British Columbia, Canada. Southworth, S.S. & Kim, M. (2015). Perceived Quality of Asian Brands by US Consumers: Case of Cosmetic Brand Using Age as a Moderator. Advances in International Marketing, 26, 235-253. Southworth, S. (2015). Preparing our students for the multichannel retailing world. Proceedings of International Textiles and Apparel Association, Santa Fe, NM, USA. Southworth, S.S. & Kim, M. (2014). Marketing strategies to alleviate risk and build trust for emerging online brands: Case of an Asian cosmetic brand entering into the USA. Journal of Digital & Social Media Marketing, 2(1), 79-90. Southworth (Song), S. & Kim, M. J. (2014). Communicating the right love languages to your customers: Applying Chapman’s Five Love Languages in a Retail Environment, Proceedings of International Textiles and Apparel Association, Charlotte, NC, USA. Southworth (Song), S. & Kim, M. J. (2014). American consumers’ attitude towards different Asian brands: Moderating role of age, Proceedings of International Textiles and Apparel Association, Charlotte, NC, USA. Song, S.S. (2013). Strategies for building brand equity for unfamiliar companies, Proceedings of International Textiles and Apparel Association, New Orleans, LA, USA. Song, S.S. & Kim, M.J. (2012). Does more mean better? An examination of visual product presentation in e-tailing, Journal of Electronic Commerce Researchh, 13(4), 345-355. Song, S. & Kim, M. J. (2012). Building brand equity for unfamiliar Asian companies. Proceedings of International Textiles and Apparel Association, Honolulu, HI, USA. Song, S. & Kim, M. J. (2012). Does bigger and more mean better? : An examination of alternative product views for handbags in online shopping context. Proceedings of AMA/ACRA Triennial Conference, Seattle, WA, USA. Song, S. & Mullet, K. (2011). Designers from US, Taiwan and South Korea: Comparison of design elements. Proceedings of International Textiles and Apparel Association, Philadelphia, PA, USA.